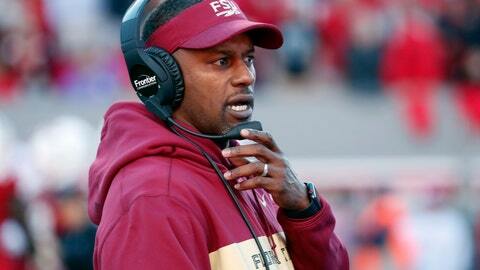 Willie Taggart’s first season at Florida State has been mostly a mess. Still, the Seminoles have a chance to salvage their season against No. 13 Florida (8-3, No. 11 CFP) in Tallahassee on Saturday. Florida State can extend the nation’s longest bowl streak — an impressive, 36-year run — with a victory against the rival Gators. The Seminoles have made a bowl game every year since 1981. Even then, they went 6-5. They haven’t finished with a losing record since 1976, legendary coach Bobby Bowden’s inaugural season. The game means more than the typical bragging rights, recruiting battles, home finale or senior day send-off. Players past and present have made that clear, and Taggart has embraced the importance of the bowl streak. Florida has plenty on the line as well. The Gators need a victory to lock up a spot in a New Year’s Six bowl, likely the Peach or the Fiesta, and are trying to end their longest losing streak in series history. Florida has dropped five straight against FSU, meaning no one on coach Dan Mullen’s roster knows what it feels like to beat the ‘Noles. That’s one reason the Seminoles have been relatively confident despite getting blown out in three of their last four games. FSU’s streak started with the Gator Bowl in 1982 and includes eight trips to the Orange, six to the Sugar, three national championships (1993, 1999, 2013) and a few stops at now-defunct bowls. Keeping it intact comes down to one game, as underdogs and against one of the program’s biggest rivals. “We got to win, no matter what. We got to win,” FSU quarterback Deondre Francois said. “The whole country knows what’s at stake. The whole (city of) Tallahassee knows what’s at stake. Our fans, our coaching staff, trainers, teachers. Mullen is 4-0 against the Seminoles, winning all four meetings while serving as the team’s offensive coordinator (2005-08). The Gators outscored FSU by an average of 36-12 in those games. Both teams feature first-year coaches for the first time since 1960, when Ray Graves began a 10-year tenure at Florida and Bill Peterson started an 11-year stint with Florida State. The Gators won that one 3-0 on Sept. 24, 1960. The Seminoles have won 15 consecutive non-conference games at home, the ninth-longest active streak among Power 5 programs. FSU’s last non-conference loss came against Florida, a 37-26 setback on Nov. 24, 2012. The Gators have widely been hailed for rebounding from last year’s 4-7 debacle. But consider this: Florida needed trick plays to beat Mississippi State and LSU, and had to rally from deficits of 18 and 17 points, respectively, to defeat Vanderbilt and South Carolina. Throw in lopsided losses to Kentucky, Georgia and Missouri, and Florida should consider itself lucky to be on the verge of a major bowl berth.